Mark Lavorato's debut poetry collection, "Wayworn Wooden Floors," is a striking piece of work, informed by an acute observer tuned to the everyday. These frank, thoughtful poems evoke both the tragedy and the comedy endemic to daily existence. Lavorato's poems are penned in accessible, unpretentious verse, which is as clear as it is varied in form, tone, and vantage. Poetry. Rhymes, verses, literary devices, cryptic meaning, my school-year headaches. When I was a student, I figured poems were pretentious pieces of literature meant to be deciphered, mainly to produce a decent essay. To me, poetry were mostly obscure and contrived. Generally, it didn’t move me or strike me as awesome. Feeling left out, I concluded my ice-cold heart just didn’t get it and that poetry was beyond me. After I left school, I didn’t want anything to do with it. In fact, for most of my reading life, I have been more sensitive to the content than the form of literature. As a child, I understood writing as a vehicle for inspiring stories. I never stopped to consider words as material for crafting beauty. Only meaning. Ironically, I developed this kind of awareness through a second language: English. Don’t ask me why. Progressively, some writers seemed more elegant, their vocabulary broader, their choices of words much more subtle, precise, and able to convey a specific feeling. Their unique and refined style gave me a good feeling when I read their work. One of those authors was Mark Lavorato, from Montreal. I read Veracity first, which I loved, but it’s with Believing Cedric that I really measured how much I enjoyed the poetic quality of his writing. I was kindly gifted a copy of his poem collection Wayworn Wooden Floors, which left me embarrassed since—remember!—I didn’t like poetry. murmuring to its own musty heights. I was astonished to actually enjoy it immediately. 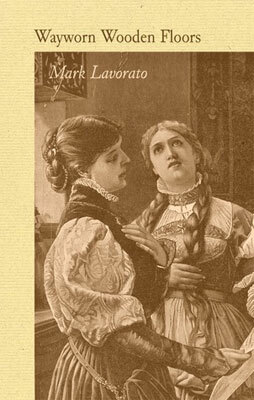 The first word that comes to mind to describe Lavorato’s poems is “accessible”. Not only I didn’t find them cryptic, but I could even relate to many of them. Some of them were humorous, some melancholic, many were contemplative, all were moving in their own ways. I really enjoyed the simplicity and the modesty of Wayworn Wooden Floors. It felt like a magnifier to our everyday life, finding all the remarkable little things we ignore, from the quiet respite of Sundays, to the silent wisdom of a Church janitor. Finally, I found that reading poetry was quite close to meditation. You can’t read poetry on autopilot so it forces you to be mindful of what you’re doing—reading—and of the feelings it triggers in you. After a few days, I decided a poem is a wonderful little piece of art to experience before you turn off the light and leave your day behind. Wayworn Wooden Floors was the first poem collection I read in more than a decade, and I’m glad it made me reconnect with an art from which I was shying away from. If you are intimidated by poetry, I am hoping this article will convince you to give it chance. Maybe get to your favourite bookstore and browse the poetry shelf till a few verses touch your heart. You might be surprised how quickly you’ll find some.